Today we are excited to bring you number 14 in Chichi Furniture’s Top 20 Fabulous French Pics. It’s slowly getting closer to that festive season, so we thought we’d introduce you to this gorgeous dining set. 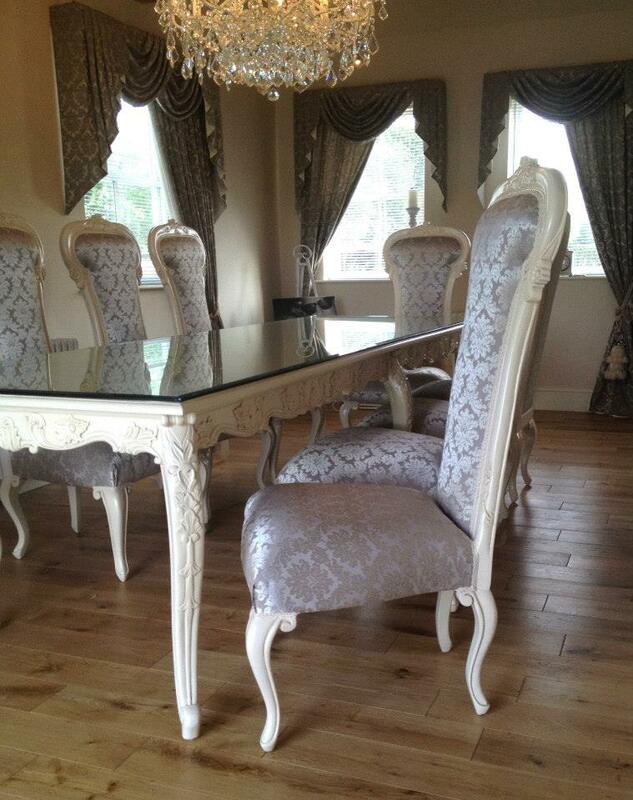 Glamorous, stylish and the perfect centre piece for your dining room, be it shabby chic or a more modern French style. The stunning upholstery perfectly compliments the classic ivory cream wood finish, which boasts elegant curves and intricate carved detailing for that added Wow factor! The chandelier above, just finishes the look perfectly. Now all thats needed is a table of friends, wine and food – happy dining everyone. French Stye Furniture is just so utterly ideal for the rough luxe look. A beautifully shaped chair, upholstered in a sumptuous velvet, couldn’t stand out more than against a rough finished wall. Its a stunning contrast that just works, allowing each style to really shine. It induces a warm, relaxed and stylish environment. I don’t know about you, but if i’ve just painted a wall a fresh crisp white and had the carpets cleaned, I would prefer it if people ‘floated’ around my home, as opposed to carrying food and drinks and leaning on walls (yes I’m am ever so slightly OCD!!) This is the beauty of the rough luxe look – it’s not meant to be perfect, it produces an amazing look without creating the need to be precious!! The furniture does all the work. The large, sparkly chandeliers shower the rooms in light, whilst the mirrors bring the unfinished walls to life. All aspects of this look link together, ensuring that the room gels and doesn’t appear disjointed and a conflict of styles. Below are some fabulous examples of furniture from Chichi which can help you achieve the look.